“No-one ever sees them,” says a character describing the alien invaders who occupied Los Angeles – and presumably the rest of the world – in this science-fiction drama. It’s that ominous note of restraint that makes Colony a worthwhile choice for both fans of the genre and the merely intrigued. On the first season of the American show (Netflix has currently uploaded two of the three that were produced) the impact of the extra-terrestrial overlords is felt constantly, but it’s measured in tangible twists and despairing revelations; you won’t see a lot, but you’ll learn enough to keep you watching as the broader conspiracies and new realities are teased out. Beginning almost a year after the sudden occupation saw giant walls descend from the sky and attack drones fill the air, the focus is the Bowman family, whose slightly askew home life soon reveals everyday compromises and the absence of their 12-year-old son, Charlie, who is somewhere on the other side of the wall from the Los Angeles bloc, in the Santa Monica enclave. 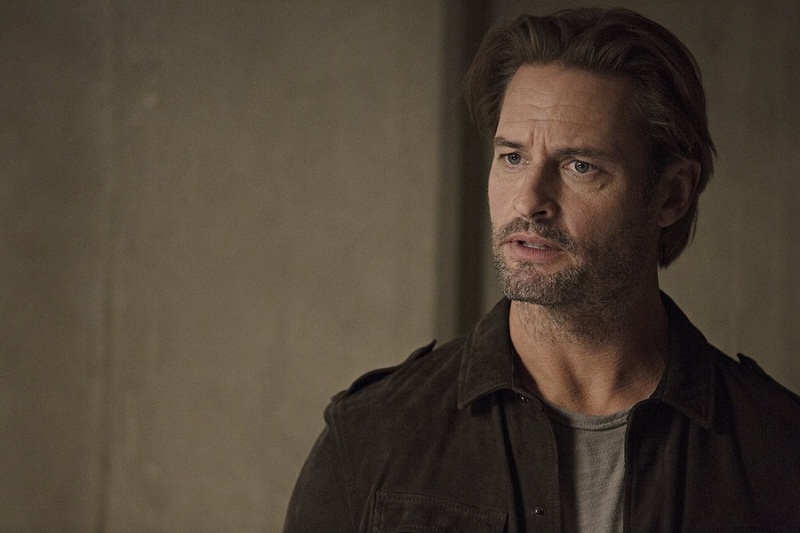 Father Will (Josh Holloway) is one of these capable former U.S Army Rangers turned FBI agents who invariably step up, but after hiding out as a mechanic to avoid arrest he’s caught trying to sneak into Santa Monica and put to work by the new human government, the Transitional Authority, to pierce the growing insurgency. What he doesn’t know is that his quarry’s latest recruit is his wife, bar owner Katie (Sarah Wayne Callies). The sunny, familiar streets they traverse have more bicycles than cars, electricity but no digital communications, a functioning economy but a nightly curfew enforced by the alien’s shoot to kill drones. If that sounds like a World War II occupation drama it’s probably deliberate. The first season depicts the attraction of collaboration, the way people change when deprived of their liberty, and the harsh necessities of defiance. The tone is often darker than you would expect, especially in regards to the resistance, who don’t just execute their enemies in the Homeland Security forces, but when necessary rival guerilla cells. Jean-Pierre Melville’s Army of Shadows, a bleak, brilliant 1969 depiction of the French WWII resistance, is an influence. As Community observed during his blessed guest episode, Josh Holloway remains “network TV good looking”, and as with his James Sawyer from Lost Will Bowman has a laconic presence – the near misses and blown stories are tense, but alongside the trauma Katie also periodically rips off his shirt before they go back to their mutual suspicions. There’s a pithy supporting cast, most notably familiar character actor Peter Jacobson as Snyder, the double-dealing head of the Los Angeles bloc. As co-creator Carlton Cuse demonstrated with Lost, he’s very good at rationing out information (concluding shows is another matter), and the expert slow drip of Colony and the fact that it embraces pessimism and not patriotism makes the first season very relatable. As Will finally admits to Kate, “we lie to everyone now”. Close (Netflix, 2019, 94 minutes): Action films with female leads often present their stars as a fighting force of nature, but in Close, the story of a female bodyguard trying to keep an unprepared heiress alive, Noomi Rapace’s Sam Carlson isn’t just tough, she’s also resourceful, dedicated, and full of endurance; she stays alive longer than her opponents. Sam is certainly a hardnosed loner, fieldstripping a pistol while throwing back shots on her time off, but even the trauma she carries has a female perspective. That stems from the movie being co-written and directed by a woman, English filmmaker Vicky Jewson, whose action scenes have a geographic sparseness and physical rigour. The plot is generic, with Sam being assigned to Zoe Tanner (Sophie Nelisse), a wild child who has just inherited a mining empire much to the ire of her stepmother, Rima (Indira Varma, Game of Thrones), and once a family compound in Morocco is breached they’re on the run. But Rapace, the original Lisbeth Salander, provides a different focus than a Gerard Butler or Liam Neeson. She fights a lot, but she’s never a mere robot and the circumstances are often influenced by men who expect to have physical dominance over her. This is a tough, visually accomplished B-movie. New on Netflix: Edgar Wright’s first American movie, Scott Pilgrim vs. the World (2010, 112 minutes) is a witty, fantastical comic book adaptation about a slacker (Michael Cera) who must level up to take on the exes of his new girlfriend (Mary Elizabeth Winstead); Senna (2010, 105 minutes) is a compelling documentary about how faith, talent, and extreme speed made Brazilian Ayrton Senna one of Formula One’s great drivers. New on SBS on Demand: American actor turned filmmaker Brady Corbet presents fascism as an outcome of Oedipal angst and childhood rage in Childhood of a Leader (2015, 111 minutes) a study of a future European dictator’s 1919 upbringing; Ben Whishaw and Matthew Goode are both exceptionally well cast as the flawed leads in the feature film version of Evelyn Waugh’s classic society tragedy Brideshead Revisited (2008, 127 minutes). New on Stan: An ominously carnivorous dive into the fashion industry, Nicola Winding Refn’s The Neon Demon (2016, 118 minutes) is a luxury horror film about Elle Fanning’s young model and her ascent through Los Angeles; David Lynch: The Art Life (2016, 89 minutes) is a tangential documentary about the filmmaker’s creative beginnings and his then – pre-Twin Peaks revival – focus on his painting studio. >> Check the complete BINGE-R archive: 151 series reviewed here, 113 movies reviewed here, and 25 lists compiled here. >> BINGE-R #124 will be in your in-box next Friday morning.